When I came upon this stalk my jaw dropped. One of the larger flower stalks that I have found in the wild and estimated it to be about 25 feet. I am more and more amazed by these beautiful plants every time I go searching for them. 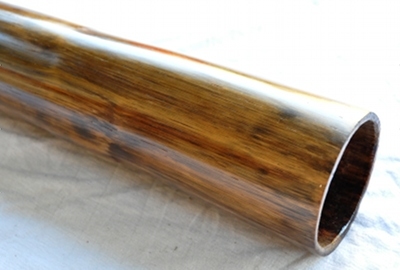 The wood has so much resonance and I knew right away that I wanted to make a big bore deep didgeridoo. Well, I accomplished my goal and this thing is just awesome. It plays so easily and puts you in an instant meditative state. A# is such a cool deep note and always has felt great to hear and play. With the huge bore there is so much bass and has such a rich drone. Incredible vocals and tongued rhythms with amazing response. If you have never owned an A# now is the time. Can’t even imagine what this would sound like through an amp! 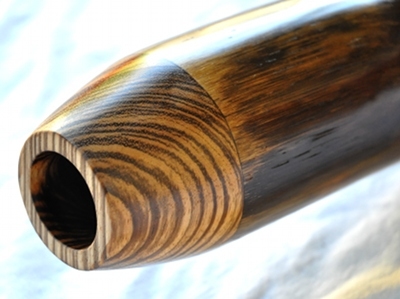 Beautiful thick piece of Zebrawood to top off this one of a kind didge!